Sulmi turned 16 on February 14th. She said, "I don't want to grow older! I want to stay 13 or 14." We had a small birthday party here at our house. I made her favorite dinner: Fettuccine Alfredo with Shrimp. We invited three of her best girlfriends; Kristel, Elizanie and Gineli to join us for a party. MaryBeth Heatwole Moore and Sylvia and Martin Rhodes were also here. MaryBeth led the gang in games after we had dinner. This photo was after the game "Ha Ha You Can't Make Me Laugh". But they did...alot...almost rolling on the floor. When the party was over, Kristel and Gineli went home and Elizanie slept over. I think it was one of her best birthdays yet. 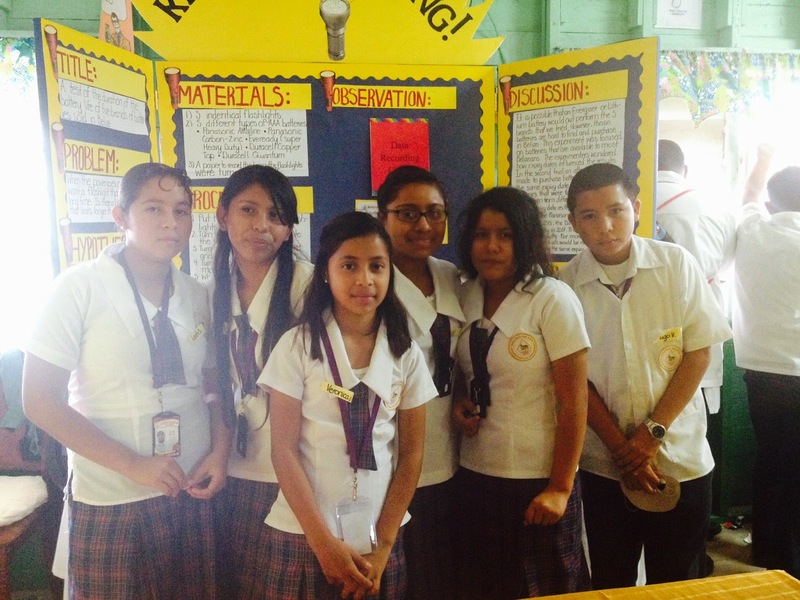 Every two years the students at Bishop Martin High School participate in a Science Fair. I remember science fairs from my teaching days in Penn Manor and Hempfield, but wowsers! This was complex and elaborate! I was impressed! Sulmi was in a group with five other freshman. They met at our house bi-weekly from November 1 to February 1. They picked a topic (it was rejected.) Then they picked another one, did the experiment, wrote it up, added data, graphs, and discussion, created a presentation board, and finally on the day of the science fair, Sulmi, Veronica and Hugo gave an oral presentation of their project before the judges. (Sulmi signed her part and Cathlene, her interpreter, voiced for her.) They got 2nd out of about 14 Freshman projects and scored 92 percentage points. I was so proud of them. Whew! It was a lot of work, but now they really know the scientific method first hand. Their topic was to discover which AAA battery powered the flashlight the longest. They ran two trials. Both times the Duracell batteries outlasted the others by more than a full day. In her other subjects she continues to earn honor roll and is learning how to study for tests. It's definitely a challenge (especially Spanish class), but she is doing well and trying very hard. Her interpreter, Cathlene Olivas, is awesome! There is not much to say because it is such a disappointingly long process. Since November the lawyer says he can do nothing until we get the home study report from the social worker. We finally got an appointment for January 15. Since then we have been waiting for her write up of the visit. She told me that I have nothing to worry about. That's great. I just worry that we wont be done in time for Sulmi and I to go to the US this summer. Please join me in praying that somehow this is resolved quickly. I'm praying for the adoption. Waiting so much is tough.